There may be no better proof of this theory than Pixar’s film from the summer of 2008, WALL-E. Here’s a movie whose lead character doesn’t speak any human language, outside of uttering his own name ad nauseam. Here’s a movie about a robot who falls in love with another robot against the backdrop of a dystopian future where the last vestiges of humanity have abandoned the trash heap once known as Earth. Here’s a movie that offers no hand-holding to the audience; we’re thrown into the deep end from the opening scene and must stick with it. The hook of a love story may intrigue audiences, but director and co-writer Andrew Stanton goes against expectations frequently. The first 40 minutes feature no human characters at all outside of archival footage of the last president/CEO of Earth, portrayed by a live-action Fred Willard. Even when WALL-E and his robotic paramour, Eve, arrive at the Axiom, the gargantuan space cruise liner where the surviving humans live, there’s only a modicum of humanity on display. There are only a handful of non-robot characters (or voices, in the case of Sigourney Weaver’s role) to latch onto; WALL-E primarily relies on visual communication, instead of verbal. Nowhere is that reliance more obvious than in the opening act, which could almost function as a short film. WALL-E’s desires in life are simple: he (it?) wants a companion, one who can offer more emotional ballast than a dog-like cockroach. WALL-E looks to the sky and longs for a connection, as the stars poke out through the grimy, polluted cloud cover. And in between wanting somebody to love, WALL-E goes about his job, not realizing that—for all intents and purposes, at least in the first 15 minutes—it’s totally pointless. WALL-E has crafted an identity for himself in the presumed centuries between his creation and when we meet him in the early 2800s, but even his name isn’t really his name; it’s an acronym for Waste Allocation Load Lifter Earth-Class. For whatever reason, he survived the end times while the rest of his brethren now lie dormant, as pieces of scrap for him to utilize as replacement parts. (One of many witty gags in the picture occurs when our WALL-E, frustrated with the wear and tear on his tire treads, samples one from a broken-down WALL-E unit, and then smoothly drives away, satisfied.) So it’s just as amazing that he’s become a distinctive, almost human character considering that all he has are the mysterious bits and pieces of human culture, as well as a worn copy of the film Hello, Dolly! to keep him company. Leaving aside the choices Stanton makes in the opening act of WALL-E, it’s important to consider the film simply on a technical level. Much has been made, in the last few years, about how the greatest living cinematographer, Roger Deakins, has been hired as a visual consultant for DreamWorks Animation on projects like How to Train Your Dragon. 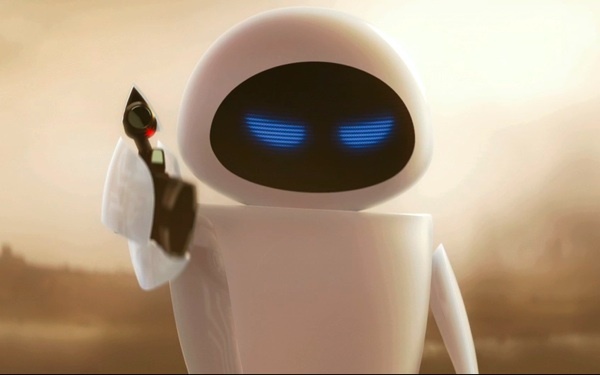 While that film does have a more striking visual flair than most DreamWorks Animation entries, Deakins’ involvement wasn’t so unique or singular; he was also credited as a visual consultant on WALL-E, and the impact is keenly felt even now. WALL-E opens (as it closes) in the outer reaches of space before zeroing in on Earth, which is almost Pigpen-esque thanks to its unpleasant and inescapable hue of dirt and grime. From this moment forward, WALL-E is, unlike any other Pixar film to date, almost disturbingly photorealistic in its animation. The animation doesn’t inspire a feeling of unease because its characters occupy the never-desirable uncanny valley, but because the depiction of Earth looks surprisingly, unnervingly real. That this is what the future could look like is haunting. Obviously, the massive visual achievement here is less about Deakins’ consulting or advice, and more about both the technological advances Pixar made throughout the 1990s and 2000s and the talented animators working on the project. In many ways, though, the reason why WALL-E feels so photorealistic in its opening scene is that it appears to be less animated and more a literal live-action piece of filmmaking. Fred Willard’s cameo, the first time any live actor appeared in a Pixar film (an early scene in Up, where Carl Fredricksen is clearly watching a real infomercial, comes close, but we never see the pitchman on screen), lends credence to the notion that WALL-E is science fiction that’s firmly grounded in our real world, not just some fanciful creation. Once the film leaves Earth behind, WALL-E becomes more animated, not just in its depiction of the Axiom, but in its darkly comic view of what humanity could become a few centuries down the line. Consider the brief shots of the captain’s quarters; in the background, there are portraits of the previous captains, who started out as traditional, non-animated human beings. As time wears on, and as they grow more obese, the past Axiom helmers lose all semblance of normal physical attributes, and become aggressively, intentionally cartoonish. A consensus that has sprung up around WALL-E over time is that its greatest moments are all on Earth, that the movie loses its unique and quirky momentum as soon as WALL-E and Eve encounter the human race, circa 2800. While the tone shifts, from one of tentative personal exploration to that of rousing adventure, the quality never flags because the central relationship between WALL-E and Eve never vanishes. The impact of their simple love story grows in importance, no doubt, as their devotion to each other essentially ends up saving the human race and bringing them back home. It would be easy for this specific column, frankly, to spend a couple thousand words talking about one of WALL-E’s finest and most transcendent moments, where WALL-E and Eve reunite outside of the Axiom after a botched shuttle flight, as the ship’s computer “defines” dancing to the childishly curious captain. Even if the first 40 minutes of WALL-E are truly singular in Pixar’s filmography, to presume that the rest of the picture isn’t equally wondrous in a possibly less daring fashion is inaccurate. If WALL-E is comparable to silent-film stars such as Buster Keaton or Jacques Tati, it’s wrong to presume that the humor of the first half isn’t equaled by WALL-E’s encounters on the Axiom, as well. 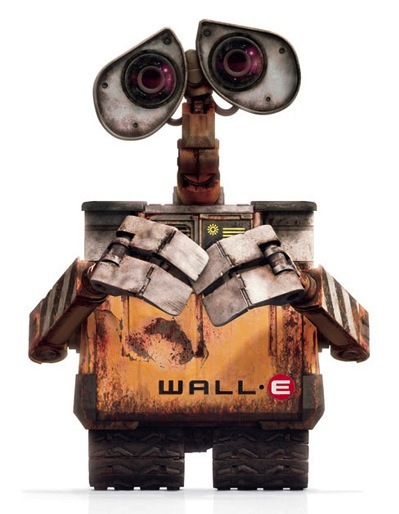 Upon repeat viewings, though, it’s the visual element of WALL-E that remains startling, fresh, and still unparalleled. It’s not that the films Pixar has made since 2008 have been poorly animated or aren’t relatively photorealistic, even when depicting fantastical worlds with monsters or living cars. It’s that the animation in WALL-E is almost confrontational in its realism. Upon the film’s initial release, there were some critics who walked away with distaste at the pro-environment message or even Willard’s character telling the Axiom autopilot to “stay the course,” a loaded phrase if ever there was one. Even though Stanton may have wanted to steer the message surrounding the film away from the political, it’s difficult to not see WALL-E, both in its representation of the frighteningly obese future of humanity and in the depiction of how humans let Earth turn into an infinite dumpster, as a polemic and a plea for the future to be the opposite of a post-apocalyptic nightmare. If that argument rankled some people, it’s worth considering that its impact was only so great because the animation was so accurate, so detailed, and so beautiful. Here is one of the reasons why we love Pixar: they find beauty in the strangest and most improbable of places. There is, in description, little beauty in the notion of a planet now made entirely of fetid, long-decomposing trash or in the boxy little robot who trundles around that planet trying fruitlessly to clean things up. Even before WALL-E sees Eve for the first time, roughly 15 minutes in, this is a film of unexpected beauty, in part because the lead character begins each day with fresh eyes. His lack of knowledge about human culture, whether it’s the function of a bra or of a defunct car alarm remote, informs what he perceives as a twisted if gorgeous environment. Once Eve arrives, she introduces a visual sleekness to the proceedings, but even when we’re spending time with just a cockroach and a junky little trash compactor, WALL-E is a striking and amazingly distinctive piece of animation. It is unquestionably the riskiest film, to date, that Pixar has ever made, and it succeeds not only because of its remarkable technical achievements but because its creators trusted the worldwide audience. The visual language of this film, as represented by the backgrounds and character design, is universal, just as the greatest animation can be. Relying on primarily visual communication is risky, but it is unquestionably the kind of risk Pixar should take more often. Pixar should, honestly, never make a WALL-E sequel. But that’s not to say they can’t make more films like WALL-E.